The Les Paul Performance Center is located in Cutler Park, in the heart of the City of Waukesha. Cutler Park, 5.77 acres, is the oldest of City parks and has the feel of a town square. Besides the Performance Center, there is the Waukesha Public Library, a parking lot, a grouping of historic Indian mounds, and playground equipment. The Les Paul Performance Center was built in 1940s. In 1963, it was moved to make way for a new library addition. There was controversy at the time whether or not to move it or tear it down. Residents nearby had complained of the noise and its appearance. In 1988, the Cutler Bandshell was renamed the Les Paul Performance Center. Les Paul, the "Wizard of Waukesha", is well known for his inventing the first multi-track recording system and pioneering modern amplification techniques. He is known as the father of the solid body electric guitar. In 2015, there were renovations including better handicap accessibility, new audio video lighting systems, side "wings" expansion; in 2016, new back lit gable signage was added. Today, as in summers past, the Les Paul Performance Center attracts a large audience and offers several nights per week of activity from Monday night movies to civic band concerts (the civic band formed in 1945) to Tribute Tuesday Concerts night. 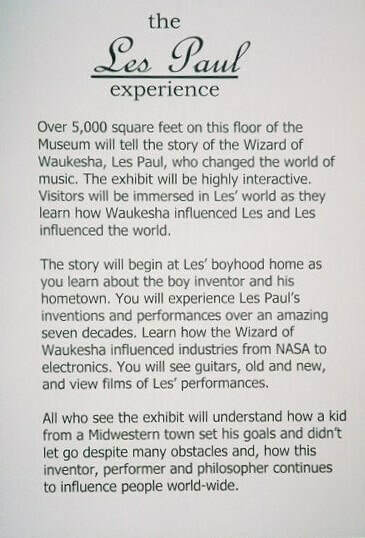 The above are from the Waukesha County Historical Society which created an exhibit in 2004 honoring Les Paul. The one to the left is of Les Paul as a youth; the second describes the exhibit. The article is from the "Milwaukee Journal" dated 4/9/2007. ​Cutler Park was purchased by the City of Waukesha in 1899 for $30,000 from Mr. Cutler after much discussion about how the cost would be greater if put off too long. It was anticipated that the property would be needed for a library and city hall. Located within the Park are prehistoric Woodland Indian mounds dating back to 2000 BC. Also, the "Railsplitter" is located within the Park. It is a bronze cannon of the Civil War era and was retired in 1922 from active participation in community affairs.